The recently restored "ex-English cemetery" —as it is called in Naples— has become a small but welcome green oasis, a public park, in the midst of a densely populated part of the city. 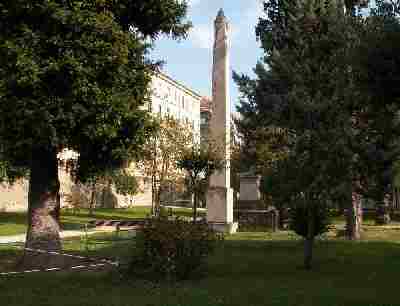 The park/cemetery is contained within the high walls adjacent to the church of Santa Maria della Fede about halfway between Piazza Garibaldi and Piazza Carlo III, just off the main north-south street, Corso Garibaldi, that connects those two squares. The term "English cemetery" might suggest that perhaps this land had something to do with WWII and the presence of a number of military cemeteries in southern Italy. Not so. Nor has it to do even with the much earlier wars of Italian unification and Giuseppe Garibaldi, who gave other land in Naples in 1861 to the British community for the construction of Christ Church, the house of worship over on the other side of the city in the Chiaia section. 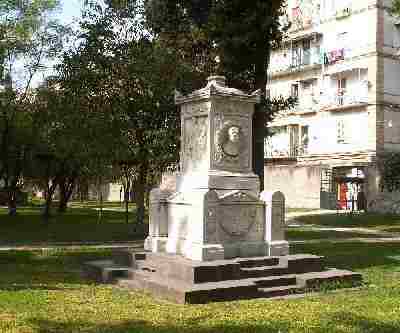 In 1826, the British Consul, Sir Henry Lushington bought land within the gardens of the church of Santa Maria della Fede for a Protestant cemetery. In those days, the old wall of the city, though not exactly intact, still formed the eastern boundary of the city, and the church was outside that wall. There was, of course, not yet a train station, and the waves of building, rebuilding and overbuilding that would engulf the eastern part of Naples were still many decades in the future. The cemetery became the final resting place for a number of people in the foreign community in the Naples of the mid-1800s, such as Dutch painter Anton Smink Pitloo (founder of the so-called "Posillipo School" of landscape painting), Scottish science writer, Mary Somerville, German botanist, Friedrich Dehnhardt, and Lady Elizabeth Craven. The entire grounds comprise church, monastery and garden. The church, itself, is on the site of an earlier, smaller one and was expanded in the mid-1600s. In its long history, the complex has been a monastery for Jesuits and then, under the reign of Charles III (the mid-1700s), a convent. Under the brief French rule (1806-1814), it was used to store grain. The church and monastery were under the auspices of the nearby Albergo dei Poveri (the Hospice for the Poor) through the early and mid-18th-century, during which time the monastery served as a hospital/laboratory for the treatment of syphilis, a particular scourge of that particular section of Naples at the time. Within the church there is significant art work by Agnese La Corcia, a woman painter from the 1700s. In 1980 the land was given by the British consulate to the city of Naples. The grounds were restored as a park between 1990-93, a project that entailed the removal of most of the graves to the main municipal cemetery of Poggioreale. Left intact and very visible remain nine funerary monuments from the second half of the 19th century that are artistically interesting, including the Mary Somerville tomb by prominent Calabrian sculptor, Francesco Jerace. His many other works include the statue of Beethoven in the courtyard of the Naples music conservatory, the statue of Victor Emanuel II on the façade of the Royal Palace in Naples, the bas-relief on the facade of the University of Naples, and the group figure of L'Azione (Action), part of the Vittoriano, the great national monument to Victor Emanuel II in Rome. In 1993, Electa publishers in Naples issued a photographic catalog of the restored premises of the gardens of Santa Maria della Fede, entitled The English Cemetery, edited by Giancarlo Alisio. BUT (!) see this unfortunate update from August 2011.